A Belfast City councillor who has been criticised heavily over a "racist, sectarian and offensive" tweet has branded the reaction to her post "completely ridiculous". Independent councillor Jolene Bunting posted a video on Facebook defending herself after being roundly criticised for posting a tweet depicting two frogs, one wearing a union jack and the other wearing an Irish tricolour. 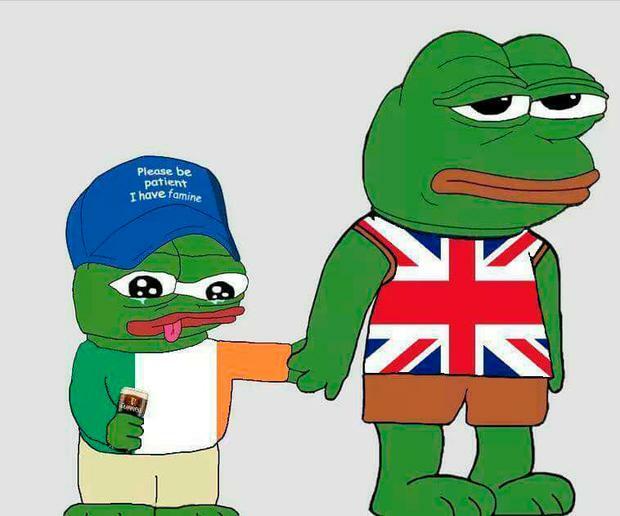 The frog in the Irish flag is crying, holding a pint of Guinness and wearing a hat that reads: “Please be patient I have famine”. She wrote above the image the line: "C'Mon Paddy, EU can leave too." In a video entitled Response to Triggered Leftists, she said: "It was a reference to Ireland leaving the EU, nothing more. I shared the image for my group, I do it regularly. "I really didn't see how this could cause controversy. "Now I will be honest, I wasn't able to read the hat without zooming in and regrettably the hat did make light of the famine. That isn't something I would usually share, and if I had of realised I wouldn't of shared it." She added: "However, the response to this post has been completely ridiculous . The leftists are well and truly triggered, I have been accused of being sectarian, racist, even a terrorist. "But what has really disgusted me has been the accusation that I would mock children with autism. To the people that have wrote that online, you are disgusting. "A lot of these posts are coming from the usual suspects. Sinn Fein IRA and their supporters. "They took up the bomb and the gun in order to make a political gain. "I have never harmed anyone and I never will harm anyone for my political aims. So take a good look at yourself before your criticise me. I hope that Ireland do take my advice and leave the EU to make that country better for everyone who lives in it." “There is no place in our politics for this. Depressingly, it seems there is no prejudice she [Jolene Bunting] is unwilling to support,” he added. SDLP representative Donal Lyons had already filed a complaint with the LGCS regarding Councillor Bunting in December in relation to an “anti-Islam” video she appeared in, which was filmed in front of Belfast Islamic centre.